President Kagame receives President Filipe Nyusi of Mozambique at Kigali International Airport. Mozambican President Filipe Nyusi arrived at Kanombe International Airport this afternoon beginning his three day state visit. 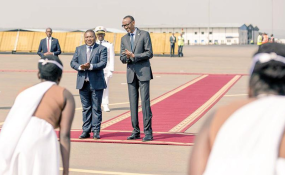 The plane carrying the head of state touched down at Kigali International Airport at 2 PM on Thursday. President Nyusi was received by his host President Paul Kagame and a section of senior government officials. His visit follows a state visit by President Paul Kagame in 2016. On the first day of the visit, Nyusi is expected to visit the Special Economic Zone before attending a state banquet hosted in his honour by his host President Kagame later on Thursday. On Friday the visiting head of state is expected to visit the Kigali Genocide Memorial and KLab tech incubation centre before heading to the border town of Rubavu. In Rubavu, he is expected to tour the recently launched one stop border post, a facility that Rwanda shares with Democratic Republic of Congo. During the visit by Kagame in 2016 the two countries agreed to speed up the implementation of the areas of cooperation. The two heads of state unanimously agreed to set up a task force to conduct follow ups, evaluation and fast track progress of the alliance operating within the confines of the ministries of foreign affairs. In 2017, Rwanda and Mozambique signed MoUs in the areas of political and diplomatic consultations; agriculture, livestock and fisheries; public administration; tourism; mineral resources; and culture. On Wednesday and Thursday this week, the first Joint Permanent Commission of Cooperation (JPCC) between Rwanda and Mozambique was held in Kigali. The two-day session was held by senior diplomatic officials of the two countries. Among the aspects of cooperation under discussion include agriculture and having the Rwanda National carrier, RwandAir commence flights to the Southern Africa country. Mozambique has also been host to a number of refugees living in the country. The two countries are expected to sign bilateral pacts before the end on the visit.